Notes: An original production by BONES. I *LOVE* popular production houses. Kurau is animated by BONES, which gave us RahXephon and Wolf's Rain. And where they are involved, the eye-candy does not disappoint. Let's start with the animation, since anime is all about animation (to me!). A lot of effort have been put it to create the scenery, which is breathtakingly beautiful. Special effects come mainly in the form of golden streaks and streams when Kurau utilizes her powers. The action sequences are fast and furious and Kurau's movement reminds me very much of Arjuna as she tumbles free-wheeling in the sky, twisting and turning. Movements are animated carefully and there are no speed-lines. I can even see Kurau's clothes billowing about her. Like Juna, Kurau's too old to be a true mahou shoujo but hey! She's got cool powers (think Nancy Makuhari) and even she makes X-Men look like cheese! Kurau is a good old-fashioned cops-chasing-bad-guys kind of setting, although Kurau is not exactly the 'bad guy' here. Driven very much by plot and characterization, we see Kurau and her pair Christmas (yeah, that's her name although we will not know the significance until the end) escape the clutches of the GPO (the police). As they travel, they meet the secondary characters that will guide them and thwart them. I like the way the police are being portrayed, true to life as they interview witness, conduct house searches and gather information and traces left behind by Kurau systematically, never resorting to out-right violence against innocent bystanders. And where they cannot win by special powers, they win by numbers...using networking and roadblocks! Kurau, as the lead, is the strong and silent type but possessing a tenderness that we can identify with. Separated from her father at a young age, blood is truly thicker than water as Kurau found out when it comes to who will render help in times of need. Kawasumi Ayako is at the top of her form as Amami Kurau. We are also given glimpses of the lives of the supporting cast, who subtly complement the show, never stealing the limelight from Kurau. There's Detective Dagu who offers assistance for his own reasons, and the dogged Detective Ayaka who is hot on the heels of Kurau, while battling demons of her own. But the best part of the casting is Christmas. Most little kids are horribly annoying but Christmas, being Kurau's pair, is truly her support and Kurau will come to depend on her more and more as the series progresses - and the fact that Christmas knows how to run away from danger, not towards it makes her all the more endearing. The music score is also a strong part of the anime, generating the all the right emotions to go along with the plot. It's all very subtle but Katsuki Yukari manage to create gentle and melancholy tunes with the piano. And there is the quiet majesty when Rynax manifests. I especially like the enchanting opening performed by Arai Akino and the haunting closing song, Moonlight. Worth mentioning is the electric guitar version of the ending theme. There is just so much soul and tension there! 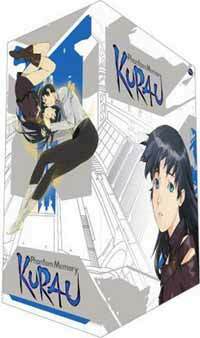 However, what I truly love about Kurau: Phantom Memory is that it touches the heart of the scientist within me. I truly empathize with and understand the feeling of Rynax who possessed Kurau's body. Having come into existence and contact with this wonderful and wide world, they are sad and reluctant to return. Rynax and humans are a form of symbiosis. What made Kurau so special that could not be achieve by others who had come into contact with Rynax was that Kurau retained her humanity and does not let go of her memories. The relationship thus becomes a form of mutualism in which both entities are in a win-win situation. Lose the humanity and the relationship becomes the polar opposite in which Rynax will consume and finally destroy the body. In short, there is very little to dislike about this series. There are no filler episodes and story moves at a crack pace as the plot unfolds over 24 episodes. I only wish they had made the full 26 episodes to tie up some loose ends. The ending is wraps up everything nicely and leaves a warm and fuzzy feeling...and no room for season 2! Recommended Audience: I'd safely say this is for teens and above who could understand the jargon and the theme. Younger audience will have to be supervised, as enemy encounters are often quite violent. Deaths scenes can be pretty dramatic when they vanish in totality.